There are a lot of things I liked about this book that outweighs the things that didn't seem to add up concerning the ending of it. And so, on a scale of the multi-use five star ratings, I decided to give it my personal four star rating of "I really liked this book, but it's still missing something." Mainly I loved the simple, breezy, cute loveliness of The Distance Between Us and it's straight-forward love story between two young teenagers. Teenage romances are often so riddled with dramatic angst and unnecessary problems that a cute little love story like the one between Caymen and Xander kind of gives a nice refreshing spin. While the ending (and a lot of the technical details) left a lot to be desired, I'm willing to let my inner teenage hopeless romantic overlook these quibbles because of how much I loved Caymen and Xander. But it wasn't just the main couple that drove the story for me, it was a lot of those little moments of character interactions (yep, there it is, one of my favorite factors of a story) that made this book so enjoyable up until the ending. Sure, the conclusion seemed a little too "picture perfect," but at the end of the day, I'm really not all too concerned with it. Caymen is just an everyday girl with her own worries about the present and the future, but with a mean streak of dry sarcasm to get her through the days. Xander is the ultimate Prince Charming of a Perfect Boyfriend who is able to return the sarcasm as it is dished to him. The only thing keeping me from falling completely in love with this boy is probably his lack of weaknesses or serious flaws... which is strange considering how I've always been irritated with the whole "broken life" past history for the usual young adult romance main male characters that require the main female character to swoop in and start the healing process (all while getting him to fall in love with her). What we end up with is a totally cute romance that I had worried would be riddled with lots of angsty misunderstandings given the premise: Caymen's mother being anti-rich people and Caymen's own pre-judgements about the rich because the father left mother and daughter when Caymen was conceived. And to be honest, against all good judgement of a good story-line's progression, I'm sure I could stand to continue reading about only all the cute moments between Caymen and Xander from the ending of this book going forward. With The Distance Between Us, I may officially add Kasie West to my list of "authors to follow like a crazy fangirl." Her penchant for humor and character creation is pretty much an ode to my own stupid, dry humor that no one ever understands. Final conclusion: Simple love story, great humorous moments, lovely heart-warming moments... it all works really well for me. I've been interested in this book for a while now, but I started it on a whim (out of all the other books I've been contemplating reading). So far, I love it. I loved Kasie West's Pivot Point a lot, so I've been paying special attention to other books she's written. 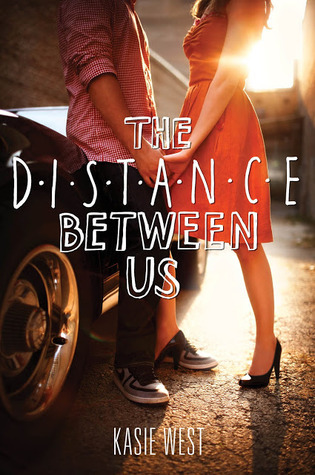 The Distance Between Us has been sitting firm on my radar for some time now, but with so many other books that keep drawing my attention, it's not easy to get around to everything. If I could stop time so that I could catch up with all the books I've missed from the past few years, that would be awesome. Only four chapters into this book and I already have a feeling I'm going to like what's to come. Caymen is my type of girl: sarcastic, prickly, with enough stubborn pride in her to create those human flaws that we all relate with easily. My mom calls it dry humor. I think that means "not funny," but it also means I'm the only one who ever knows it's a joke. Also, I'm already picking up that "I must read the next chapter NOW" vibe. I had to forcefully make myself turn OFF the Kindle and go to sleep. I haven't pinned down Xander yet, but I hope he doesn't turn into a typical YA male. And I'm getting strange vibes from Caymen's best friend's boyfriend. I'm also getting strange vibes from Caymen's mom. Yeah. If anything, I'm sure the curiosity of the direction this story is taking is enough to hook me. "You know I appreciate you, right?" I shrug. "It's no big deal." "It is to me. I don't know what I'd do without you." "I think you'd own lots of cats." "Really? You think I'd be a cat lady?" I nod slowly. "Yeah. That or nutcrackers." "What? Nutcrackers? I don't even like nuts." "You don't have to like nuts to own lots of wide-mouthed wooden dolls." A cute exchange that shows the nonsensical humor of Caymen. Oh yeah. I think I'm going to love her! This update was originally posted at Ani's Book Abyss / BookLikes in January 2014.